1. We know very little about this game other than the fact that it has an awesome lighting engine! What can you tell us about the game's story? The story takes place in the official chronology of Legend of Zelda, where Ganon won and the hero of time lost.. This fact caused Hyrules to enter to a dark age where there is war and decadency. Far away, in a place called “Earth of nobody” a youngster link lives with his grandfather Mudora. They live in a cottage, near two big towers. One night, the Tower of the Moon starts to tremble and pieces of it fall from the sky. After that, the moon doesn’t came up again. Mudora also starts to act strange, insisting in training link in the art of the sword. 2. What is this being developed in? I am developing this game with C++, with simple direct layer SDL 2.1, using the solarus engine. 3. I see there's a day/night clock in your trailer. 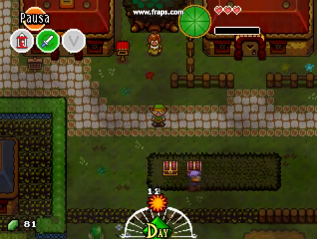 Is there going to be a timer like in Majora's Mask, or is it just there so the player can keep track of time? There won’t be a loop of several days like there was in Majora’s. However, there will be several events that will take place in specific hours and places. Therefore, the gameplay will change with the pass of day and night. The events will also change when link accomplish some requirements or miniquests, something like what happened in Terranigma when you built up the cities. Every Zelda has a defining point. In this case the defining point isn’t the pass of time but the fact that link has absolute freedom to affect the world evolution. Link will has Hyrule’s destiny in his hands literally this time. In Dark Ages your allies can be your enemies, and your enemies can become your allies. The heroe’s power is related with this ability of choosing which side he wants to support. 4. I'm liking the SNES box art mockup! Are you planning on making this compatible with the console? Can we also get a few screenshots for the wiki? Unfortunately, because of the functions I’m using right now for developing the game, a conversion is not possible. I have to admit that programming for SNES it looks like highly interesting. However, I suppose you will be happy to know that the libraries I am using are multisystem, and therefore, the game will be enjoyed in Windows, Linux, Mac, Android and IOS since its release. After that we will see which other platforms can be added in. This page was last modified on 6 April 2015, at 11:52.